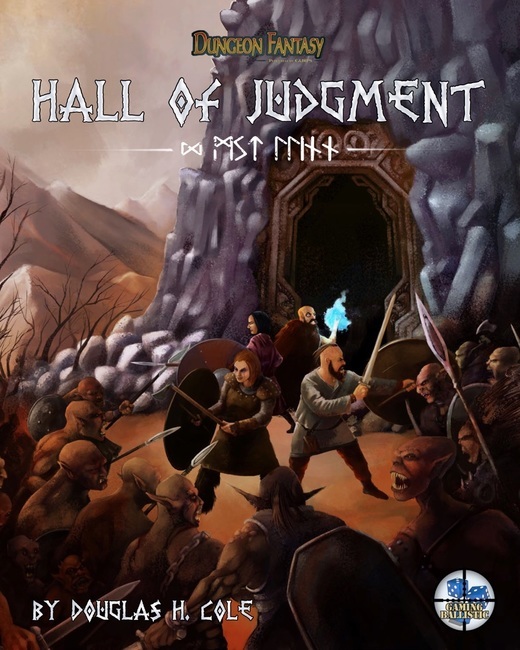 Hall of Judgment is a particularly notable adventure for the Dungeon Fantasy RPG, because it’s published not by Steve Jackson Games but by Gaming Ballistic LLC. It’s not only the first licensed DFRPG book, it’s also the first licensed GURPS book I’ve ever heard of. It was published fairly recently as of this writing, after a successful kickstarter campaign. I backed it pretty early on, and now I have a copy of the final Hall of Judgment PDF in my screen. So let’s review it! If you already have the DFRPG boxed set and are looking for supplements to add to your game, this should be at the very top of your shopping list. It contains a Viking-flavored mini-setting with plenty of cultural notes; four separate dungeons; a set of rules for wilderness travel; the GURPS version of the Dungeon Grappling rules; approximately 30 new monsters; and 16 setting-appropriate pre-made player characters. If you also have the Dragon Heresy intro set and wanted to play in that setting using GURPS rules, then this book should get you most of the way there. Hall of Judgment is a 132-page book describing all of the stuff I mentioned in the TL; DR section. I backed this at the PDF level, so this is what I have. The physical book will be softcover and produced via Print-on-Demand - it seems the campaign didn’t quite reach the stretch goal for fancier printing options. The layout is a bit similar to that of the Dragon Heresy intro-set, but it feels “GURPSier”, as it should. The font is a bit different, the columns are closer together and the ornamentation around the edges of the pages is different. It all still feels pretty Vigking-ish. Hall of Judgement also reuses several pieces of art from the DH intro set, which is fine by me as they also fit well here. The writing is reminiscent of plenty of other Dungeon Fantasy products, a style I personally like. The setting descriptions are written in a way that makes it more amenable to a full reading than quick reference, but the dungeons have a clearly labeled section for each room, with labeled paragraphs describing the challenges, rewards, alternative ways of dealing with the challenges, and anything that might be initially concealed from the PCs. I’m sure the Ten Foot Pole guy would think they’re still a little too verbose, though. Along with the PDF I also got two zip files containing full-sized versions of the encounter and dungeon maps present in the book. The encounter maps have no grid, which means they’re suitable for use in a virtual table-top program. And once again, this book has a table of contents and index comparable to those of a GURPS book, which is awesome. The mini-setting contained in this book consists of the city of Isfjall and its surrounding region, which includes Lake Odin, a few other named-but-not-described villages, and a large and dangerous wilderness containing four separate dungeons. One of those is the titular Hall. This is a significant expansion over this adventure’s initial incarnation as Lost Hall of Tyr for D&D 5th Edition, which from what I gather started with the PCs arriving near the Hall already. The whole setting is really a slice of Torengar, the Dragon Heresy world, but in the KS campaign’s words it has been “mildly de-Norsed” so as to be dropped into any Dungeon Fantasy campaign as the generic “Frozen North” from which barbarian characters frequently hail. Isfjall is described in great detail for a Dungeon Fantasy work, in which “Town” is usually entirely abstract. You get a rundown of the town’s economy, a little primer on local culture, social hiearchies, religion and law, and a list of almost-weekly festivals covering the whole year. Reading this you get a real sense of why people built a town here, where the money and food comes from, and what their daily lives are like. You can set your adventure at any given day in a year and know what the town will look like on that day, from the information given here. This plus a table of rumors and the hook for the main dungeon take up a little under 20 pages. I liked this section quite a lot. It’s a nice departure from the “village of dirt farmers plagued by mysterious disappearances” that features in so many D&D-ish modules, and it’s easy enough to modify. You can add the serial numbers back on by replacing a few names, if you want to play in Torengar or stop pretending the local pantheon aren’t the Aesir. You can also take it in the other direction and, say, turn this into the basis for a Skyrim adaptation. Right after the chapter on Isfjall is a chapter on “The Journey”, which has a neat little set of wilderness travel rules. They won’t be news to people who already own GURPS Dungeon Fantasy 16, but they’re an awesome addition for anyone who only owns the boxed set. Each of the three sub-regions the PCs will need to traverse to reach the Hall are given their own encounter table, which contains a good mix of natural obstacles and non-hostile encounters in addition to hostile monsters. There is also a weather table covering the whole year. If you want to really challenge your party, have them set out to find the Hall in the middle of winter. All this wilderness traveling can lead to one of four different dungeons. There’s a ruined fortress built atop a barrow that contains the spirits of all its inhabitants, two different fae lairs and the Hall of Judgment itself. At no point are your players forced to go to any of them - there’s a strong hook pointing them towards the Hall, but the adventure doesn’t impose any punishment on the PCs if they want to do something else first, or instead. There are also other minor hook suggestions here for GMs who want to make up their own adventures in the setting. The ruined fortress and the Hall of Judgment feel suitably Nordic, and the PCs are likely to visit the first in their search for the second. The two faerie warrens are entirely optional deathraps that should be a blast to GM. Aside from the town setting and dungeons, this book contains plenty of new material that should be useful for other campaigns. I already mentioned the wilderness travel rules - the generic portion of them takes up about two pages, and the specific portion provides a good worked example of how to stat up a region’s weather. Then you have Fantastic Dungeon Grappling, which is basically the GURPS version of Dungeon Grappling rules Mr. Cole wrote for several editions of D&D, which in turn are a simplified version of the Technical Grappling rules he originally wrote as a GURPS. I posted my own take on a simplified Technical Grappling a few months ago, but the rules from this book are better and I recommend using them if you can. I’ve already used them to great effect in a game I’m GMing. If grappling rules don’t ring your bell, the 30+ new monsters statted up here should make up for that. Each gets a page, with description, DFRPG stats, and an illustration. All of them show up somewhere in the adventure, though your PCs aren’t expected to fight every last one. You get a mix of wild and domestic animals, some humans, a few undead and demons, and a whole lot of faeries from Norse mythology. Even the weakest of those are quite a bit scarier than you’d expect from their appearance. After the bestiary there’s a group of 16 ready-to-play PCs, most of which are local to the region. Since the adventure is written for a group of 4 to 6, this is more than enough to assemble a number of possible parties, which would make this adventure a lot easier to pick up and play provided the GM knows the book. I got this book by backing the Kickstarter campaign at the US$10 tier. It’s now available on Warehouse 23 or Gaming Ballistic for US$12.50. In its 132 pages it contains an adventure, a setting, new rules, a bestiary and a pre-made PC portfolio. Given that your typical Dungeon Fantasy supplement only does one of these things, costs $8, and likely contains some of the same material that was put into the DFRPG boxed set, this book should probably be at the top of your shopping list if all you have is that boxed set. Even if you’re a GURPS Dungeon Fantasy player, this is still excellent value for the money, as the only redundant bit here would be the 2 pages of wilderness travel rules, and that only if you already have DF 16.